Enjoy our Easy Cheesy Corn Casserole with prep time under an hour. 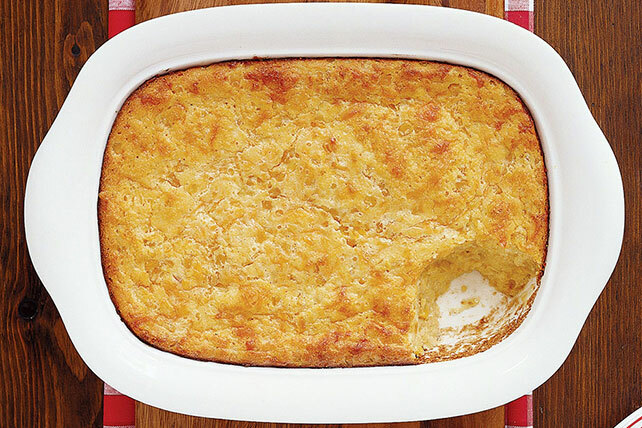 This cheesy corn casserole features whole kernels, cream style corn and corn muffin mix. Preheat oven to 375°F. Whisk cream cheese and milk until smooth. Stir in remaining ingredients until well blended. Bake 34 to 36 min. or until golden brown. Looking for something to serve at your next brunch? This Easy Cheesy Corn Bake makes enough for 12 servings! Prepare as directed, adding 1/4 cup each finely chopped red peppers and green onions to the batter before spooning into baking dish. Replace cornbread mix with 3/4 cup each: cornmeal and flour, 1/4 cup sugar and 1 Tbsp. baking powder. Continue as directed.